“We need, first, to take charge of our own learning, and next, help others take charge of their own learning. We need to move beyond the idea that an education is something that is provided for us, and toward the idea that an education is something that we create for ourselves. It is time, in other words, that we change our attitude toward learning and the educational system in general” (Downes, 2010, para 16). The concept of socialisation in learning has long been acknowledged as essential to knowledge building and attainment in the field of education (Belbase, 2011, p.3; Cobb, 2005, p.41; Dewey, 1910; Perkins, 2009, p.7). In the Digital Age, as educators and students alike begin to favour models of connected learning over the static environment of the traditional classroom, socialisation in learning has begun to establish itself through the use of social media and networking applications, “a group of Internet-based applications that build on the ideological and technological foundations of Web 2.0, and that allow the creation and exchange of user-generated content” (Kaplan and Haenlein, 2010, pp. 61). These innovations and technological developments that allow for online collaboration and socialisation, enable us to expand our knowledge-building ecosystems and move away from the concept of the classroom teacher as the owner of all knowledge and information (Pink as citied in Bingham & Conner, 2010, loc. 177). Moving away from traditional model of learning where the teacher acts as holder of all knowledge to a social, networked approach to learning where all participants are part of the learning process (Grout, 2013). Thus as educators, whether we like it or not, we must embrace social media and networking within our own learning ecologies so that we can extend these learning opportunities to our students of the Digital Age. Just as businesses of the twenty-first century have been forced to up-skill and transform their business models to avoid losing currency, educators cannot ignore the pull of social media and networking to meet the natural drive of socialisation as these emerging technologies, “allow us to embrace the needs of changing workplace demographics and enable people of all ages to learn in ways that are comfortable and convenient for them” (Bingham & Conner, 2010, loc. 184). In echoing the sentiment of Downes when he suggests we must first take charge of our learning before assisting others with their learning, the time has come for educators to embrace social media and networking in their own learning so that they can benefit from, participate in and model this learning for both their peers and their students (2010, para. 16). Whereas traditional education has taught us that learning only happens in the classroom, the rise of social media and networking has proven that learning happens in a variety of ways and places beyond the classroom, opening doors for citizens in the digital age to be, “more effective, more knowledgeable, more energised, and more efficient as professional educators,” and ultimately, as learners (Whitaker, Zoul & Casas, 2015, loc. 205). Opening the door to learning beyond the classroom (Encyclopædia Britannica ImageQuest, 2015). As Perkins suggests in Futurewise: Educating Our Children For A Changing World, We must consider what constitutes our learning ecology and ‘go beyond’ the world of traditional education to ensure our students are prepared for learning that is ‘lifeworthy’ – “likely to matter in the lives learners are likely to live” (2014, loc 395), and ‘lifeready’ -“ready to pop up on appropriate occasions and help make sense of the world” (2014, loc 694). This learning will only be possible when we consider learning collectives in networked environments, rather than learning in our traditional hierarchal classrooms (Schravemade, 2015, para. 4). What is different about teaching and learning using social media and networking is that we are working in environments that we cannot control. The traditional learning relationships we had with our peers and students took place in physical environments, however in the digital age, they are happening in front of an audience we cannot monitor, mandate or select. The notion of connected learning is not one we can learn from a textbook, it involves educators stepping out of their comfort zone and, not only reading or viewing the work of students, but adopting a mindset that places them in the position of learner as they participate in the processes involved with, not only their individual learning, but also that of their peers and students (Whitaker et al., 2015, loc. 248). If, “social learning happens using social media tools and through extended access and conversations with all our connections – in our workplaces, our communities, and online. It happens when we keep the conversation going on a blog rich with comments, through coaching and mentoring, or even during a workout at the gym,” as Bingham and Conner suggest in The New Social Learning: A Guide to Transforming Organizations Through Social Media, then we as educators must ourselves be comfortable with and understand how to participate in such environments (2010, loc. 340). This is where teaching and learning using social media and networking constitutes a serendipitous relationship with educators. Piaget asserted that, “cognitive conflict created by social interaction is the locus at which the power driving intellectual development is generated” (Perret-Clermont, 1980, p. 12). In this sense, cognition is a collaborative process, and the mind of the learner creates meaning, knowledge and understanding through dialogue, interaction and conversation with others (Ernest, 1995). Research such as that by Bell, Grossen and Perret-Clermont (1985) affirms this social practice, as they assert that students who are actively engaged in working with their peers display greater cognitive growth than those working alone. This promotes the idea that, “personal experiences of individuals become social and collective experiences when they are shared, interacted, and retained as knowledge” (Belbase, 2011, p.3). It is essential then, that as educators we examine how our pedagogy encourages students to participate and be guided by others in their learning. In the twenty-first century, we must embrace trends in technological development such as social media and networking to provide learning experiences reflective of the Digital Age. It becomes innate for educators to continue their serendipitous relationship with socialisation in learning through the participatory culture that is social media and networking. In the video below, Helen Haste articulates the collaborative nature of information gathering and knowledge development in the twenty-first century (2009). Social media and networking present the perfect platforms to encourage collaborative an co-operative perspectives through technology use. It is our role as educators to embrace these in our learning so that we can model, participate in and extend this opportunity to our students. The first step in this process as educators is to become digital citizens and connected learners ourselves, so that we can effectively and successfully extend this opportunity to our students. The interactive infographic ‘Getting Started With Digital Citizenship: Social Media and Networking’ shared in a previous post provides a bank of resources for educators to use as a guide when they begin their journey as connected learners, exploring digital citizenship through social media and networking. Belbase, S. (2011). Radical versus social constructivism: dilemma, dialogue, and defense [Online Submission]. Retrieved from ERIC database. (ED525159). Bell, N. Grossen, M. Perret-Clermont, A.N. (1985). Sociocognitive conflict and intellectual growth. In M.W. Berkowitz (Ed. ), Peer conflict and psychological growth. San Francisco: Jossey-Bass. Cobb, P. (2005). Where is the mind? A coordination of sociocultural and cognitive constructivist perspectives. In C. Twomey Fosnot (Ed. ), Constructivism: theory, perspectives and practice (2nd Ed.). New York, NY: Teachers College Press. Dewey, J. (1910). How we think. Boston: DC Heath. Ernest, P. (1995). The one and the many. In L. P Steffe & J. Gale (Eds. ), Constructivism in education (pp. 459-486). Hillsdale, NJ: Lawrence Erlbaum. Perkins, D. N. (2009). Making learning whole: How seven principles of teaching can transform education. San Francisco, CA: Jossey-Bass. Perret-Clermont, A. N. (1980). Social interaction and cognitive development in children. Academic Press. The relentless pace of change of the twenty-first century has framed learning as a cultural phenomenon as globalisation, technological advancements and the rise of the digital age have created a need for citizens to become lifelong learners who are constantly up-skilling in order to survive and thrive (Douglas & Seely Brown, 2011, loc 50; Jarvis, 2009, p.15). The digital age has removed many of the physical restrictions placed on learning, as technologies allow us to travel around the world and access a ubiquity of information at the click of a button (Selwyn, 2013, p.2). The Future of Learning (Redecker et al., 2011, p. 9). The image above provides a conceptual map of the future of learning and the influence of drivers and Information Communication Technology (ICT) trends on education means that, more than ever, teachers are expected to be adept at a variety of technology-based pedagogical practices in order to promote twenty-first century learning experiences for their students (Johnson, Adams Becker, Estrada & Freedman, 2014, p.6). In response to the ever-changing notions of learning in the twenty-first century, Perkins suggests that educators must begin to provide learning experiences that are both ‘lifeworthy’- “likely to matter in the lives learners are likely to live” (2014, p. 8), and ‘lifeready’ – “ready to pop up on appropriate occasions and help make sense of the world” (2014, p. 24).Consequently, as educators in this society, to offer lifeworthy and lifeready learning to our students, our classrooms must become what Boccini, Kampylis and Punie describe as ‘live ecosystems’, environments that constantly evolve and change to suit the context and culture of which they are a part (2012). It becomes essential then that we meet the learning needs of students by creating, “a sustainable learning ecology that is shaped by the ubiquity of information, globally responsive pedagogical practices, and driven by collaboration and informal learning in multiple access points and through multiple mediums” (O’Connell, 2015). The greatest challenge for educators in the digital age becomes how to alter their pedagogy and curricula to provide lifeready and lifeworthy learning for students that will be likely to matter to them in their future (Perkins, 2014). Therefore networked concepts such as expert amateurism and connected learning are essential starting points for educators in ensuring the learning that happens in their classrooms is future-proof. In the video above, Alan November poses some important questions about the role of teaching and learning in the digital age. He emphasises that we must accept the idea of ‘digital natives’ as a myth and acknowledge the fact that, just because today’s learners were born into the digital age, they are not necessarily prepared for learning in the digital age. Thus, we must accept that our society of ubiquitous information access does not make redundant the role of the teacher, as information access does not equal knowledge attainment (Seely Brown & Duguid, 2000). Rather, it becomes the role of the teacher to ensure that all learning experienced in the classroom is genuine, viable and future-orientated. This is where Perkin’s notions of lifeready and lifeworthy learning become, essential for educators of the digital age in ensuring the currency and relevancy of what they are teaching. Traditionally, education in schools has been concerned with educating for a known future, where tried and true hierarchical structures were dictated by curriculum organised into disciplines. Perkins asserts that while a hierarchical structure offers advantages of simplicity and organisation, it does not aptly reflect the learners of the digital age, who are living in an increasingly networked and globalised world, calling educators to rethink the how, what and why of teaching to incorporate the expanding measure of what is worth learning (2014, p.41). Similarly, Douglas and Seely Brown suggest that we must consider the change in learning that happened with the move from the stable infrastructure of the twentieth century to the fluid infrastructure of the twenty-first century (2011, loc. 50). 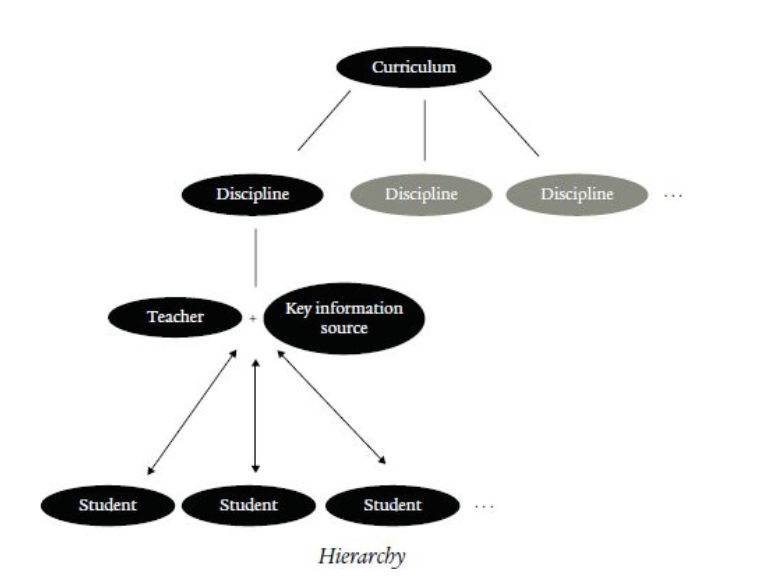 Traditional Hierarchical Structure of Education (Perkins, 2014, p.41). 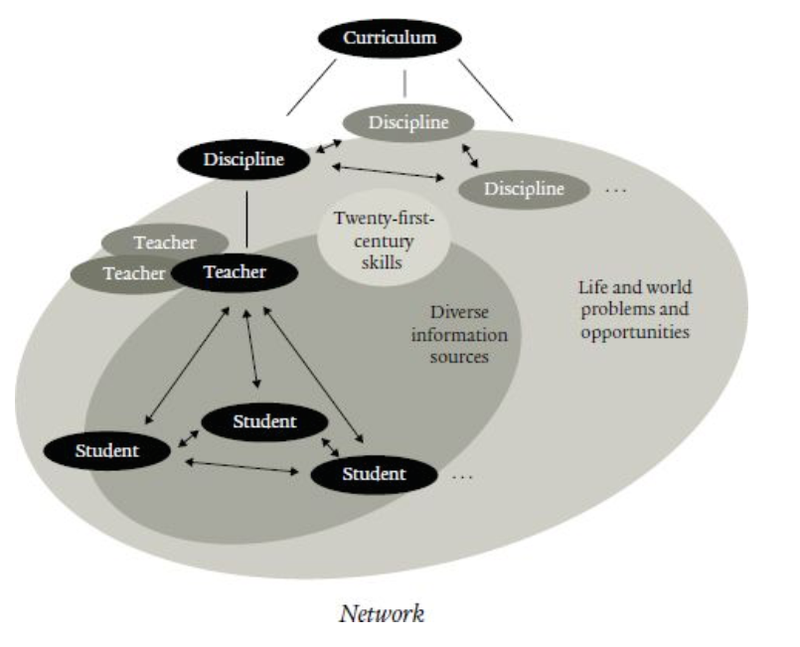 Networked Structure of Education in the Digital Age (Perkins, 2014, p.42). Thus, a more networked approach to learning that incorporates lifeready and lifeworthy learning is essential as, “a network structure mirrors today’s multiplicity of engagements and serves today’s learners better: disciplines related to one another, teachers collaborating with one another, students interact richly with one another, drawing on diverse information sources, addressing twenty-first century skills, and engaging life and world problems and opportunities” (2014, p.47). It becomes evident then, that educators must begin to consider how the influence of networked environments reshapes the learning that is valued by students in their classrooms and the relevance the learning that takes places will have in the lives their students are likely to live. The video above articulates perfectly the decreasing value of knowledge attainment alone in a world where we can access all of the information we need online. What is more important is knowing how to ask the right questions and building the skills we need to assist us in knowing what to do when we do not know what to do. Therefore, considering a networked curriculum that caters for expert amateurism, becomes a way for educators to provide lifeready and lifeworthy learning that will enable them to succeed beyond their time at school. Perkins states that an, “expert amateur understands the basics and applies them confidently, correctly and flexibly” (2014, p.38). Furthermore, this notion of expert amateurism serves much of the learning we do outside the school environment in our everyday lives. While not devaluing the role of specialisation and traditional disciplines, expert amateurism has the potential to play an appropriate role at the foundation of our curricula in the digital age. It allows us to practice the skills of lifelong learning as we apply what we know to look outwards towards the networked world around us, instead of inwards towards our insular scholarly disciplines. Of course, our traditional focus on building expertise in each discipline by way of advanced technical content has value later in life as individuals choose to specialise in areas that interest them, however, in our school environments, this is unlikely to have much value to the majority of students in the lives they are likely to live (Perkins, 2014). Embracing expert amateurism allows us to ensure that the students in our classrooms are able to make connections outside of specific learning areas and connect their learning to build greater understanding, just as they do in their everyday life outside of the classroom. Expert Amateurism works to provide lifeready and lifeworthy learning (Storm, 2013). Redecker et al., state that two of the biggest challenges in providing lifeready and lifeworthy learning are: providing transition between the worlds of school and future employment, and focussing on permanent re-skilling to enable all citizens to adjust quickly to new environments (2011, p.10). As educators in the digital age then, we must work to build and model expert amateurism for our students to ensure that learning in the classroom is lifeready and lifeworthy. When we consider the role of expert amateurism in a networked approach to learning, we are providing learning that allows students to use what they know to make connections and reflect best-practice in the digital age, as students are able to go beyond the insular walls of their classroom. Expert amateurism provides students with the basics they need to thrive and survive in the twenty-first century as they navigate their way through an ever-changing and digital world. Connected learning provides an approach to teaching and learning that assists educators in building expert amateurism and move away from a hierarchical structure towards a networked structure of learning in their classroom. The ever-present change of the twenty-first century means that educators have to seamlessly adapt their practices to suit new technologies, skills, learning environments and the needs of their students (Cantrill, et. al., 2014, p. 4). Outside of school, our students are learning, engaging and producing in productive and collaborative ways, using digital media and networked environments (Cantrill, et. al, 2014, p.6). Thus, while not born in the digital age, the principles of connected learning are befitting of it, as it promotes student-driven connection that requires active participation and collaboration in front of a real-world audience (O’Connell, 2015b). With the world at their fingertips, students of the digital age have diverse pathways in which they can access connected learning, enabling connections between their learning at school and their networks and interests outside of school, providing learning that is both lifeready and lifeworthy. Embracing a connected learning framework in our pedagogical approaches enables us to draw focus away from particular technologies that often take precedent in the digital age, and instead, focus on the value of learning through, “purposeful integration of tools for social connection, creations and linking the classroom, community and home” (Ito, et. al., 2013, p.33). 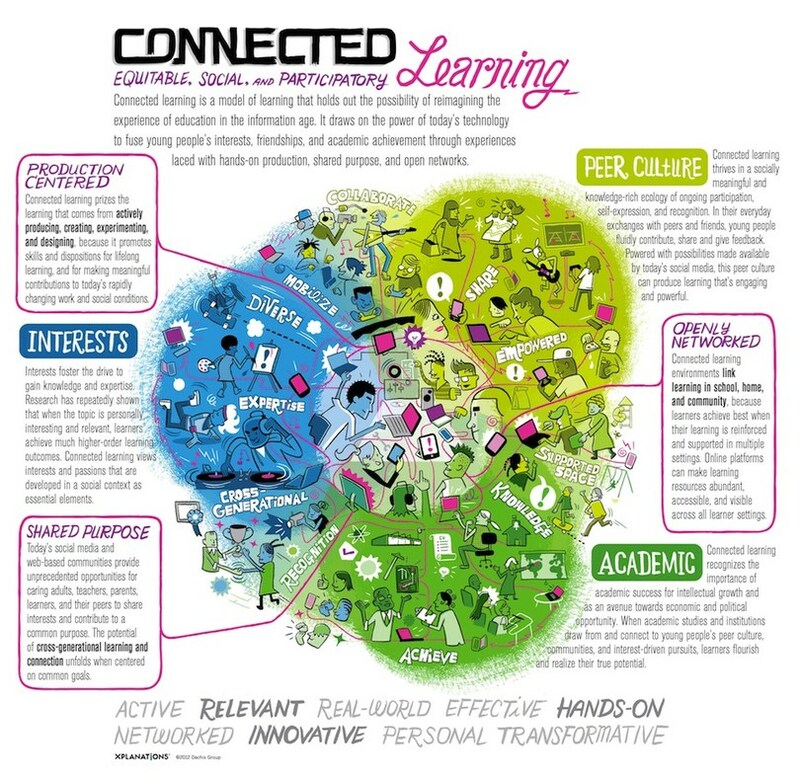 As evidenced in the infographic below, connected learning encompasses production-centred, openly networked learning, that is driven by interests and shared purpose and allows for collaboration and academic growth. Connected Learning (Connected Learning, 2013). The Connected Learning Framework below demonstrates the ability of connected learning to allow students to look outwards from curricula and create and build connections naturally, based on their interests. With educators both guiding and modelling connected learning, there is much potential to provide learning that is lifeready and lifeworthy and conducive to the digital age. Connected Learning Framework (Ito, et. al., 2013, p. 12). The video below provides an authentic example of connected learning in practice. The combination of a student demonstrating the notion of expert amateurism combined with connected learning principles in this example attests to the power of learning that is both lifeready and lifeworthy. The highly networked society of the digital age means that students are coming to school indoctrinated by our culture of lifelong learning, and if we are not careful, will be met with out-dated models of teaching and learning that do not promote engagement of lifeready and lifeworthy learning. By foregrounding the way we learn in the digital age, rather than focusing on knowledge attainment and expertise alone, and embracing concepts such as expert amateurism and connected learning in our teaching practice, we will provide our students with the skills and ability to continue learning in their life beyond school. We must begin to turn away from traditional hierarchical structures of education that could be seen to value what was already prescribed and valued knowledge and focus on building skills in learning that prepares students for learning in the world they are likely to live (Starkey, 2011, p. 19). Siemansarticulates learning in the digital age as, “a process that occurs within nebulous environments of shifting core elements – not entirely under the control of the individual. Learning… can reside outside of ourselves (within an organization or a database), is focused on connecting specialized information sets, and the connections that enable us to learn more are more important than our current state of knowing” (2004, para. 23). As educators, if we begin to explore the notions of expert amateurism and connected learning in our classrooms, we will be well on the way to meeting the needs of digital age learning. If we continue to value the hierarchical practices of traditional education that value knowledge attainment alone, without evolving to more networked structures promoting transferable knowledge and skills, we will not ensure that we are preparing students for lifeready and lifeworthy learning necessary of the digital age. 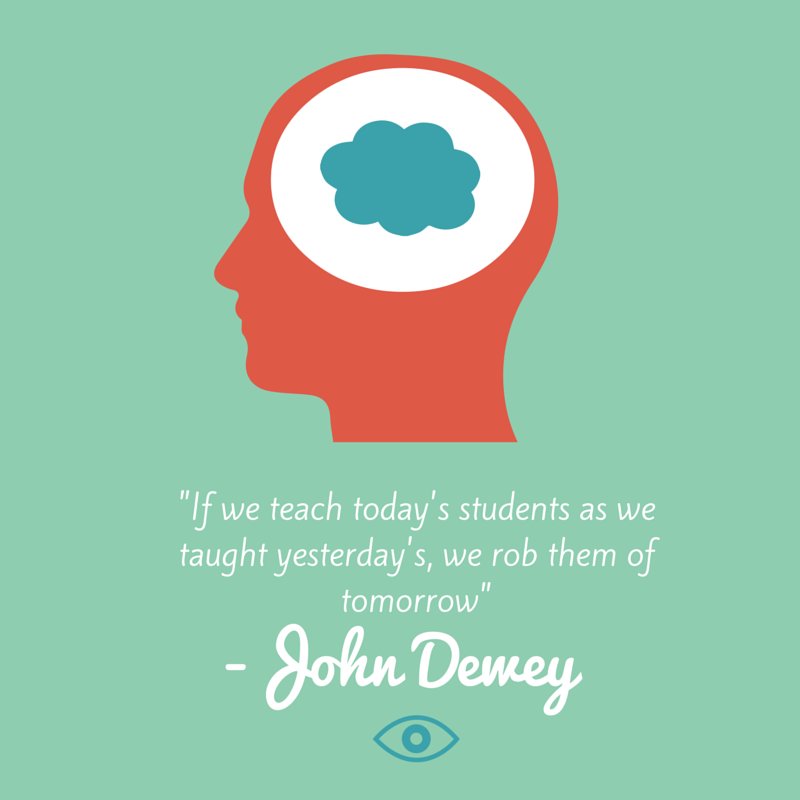 We must begin to embrace a culture of learning indicative of twenty-first century practices in the digital age so that we are preparing students for their future, and not the future we thought they would have. Bocconi, S., Kampylis, P. G., & Punie, Y. (2012). Innovating learning: Key elements for developing creative classrooms in Europe. Joint Research Centre–Institute for Prospective Technological Studies. European Commission. Publications Office of the European Union: Luxembourg. doi: 10, 90566. Cantrill, C., Filipiak, D., Garcia, A., Hunt, B., Lee, C., Mirra., O’Donnell-Allen, C., & Peppler, K. (2014). Teaching in the connected learning classroom (ed. A. Garcia). Irvine, CA: Digital Media and Learning Research Hub. Ito, M., Guitierrez, K., Livingstone, S., Penuel, B., Rhodes, J., Salen, K., Schor, J., Sefton-Green, J., & Craig Watkins, C. (2013). Connected learning: an agenda for research and design. Irvine, CA: Digital Media and Learning Research Hub. Jarvis, P. (2009). The Routledge international handbook of lifelong learning. Hoboken: Taylor and Francis. Perkins, D. (2014). Future wise: Educating our children for a changing world. San Francisco, CA: John Wiley & Sons. Selwyn, N. (2013). Education in a digital world: Global perspectives on technology and education. New York: Routledge. It is an interesting time in the world of teaching and learning. The digital age has catapulted us into an era we were not quite ready for and many educators are holding on by the ‘skin of their teeth’, struggling to achieve pedagogical practices and curriculum worthy of twenty-first century learning (Burgess, 2012, loc. 103; Marzano, 2007, loc. 33; Price, 2013, p. 20). The relevance and currency of our traditional teaching and learning methods have been debated in numerous spheres and countless movements in education are recognising the need for transformation in the ways we teach and learn to cope with the ubiquitous connectivity and information overload of our students (Costa & Kallick, 2009; Crockett, Jukes & Churches, 2011; Gardner, 2006; Hattie & Yates, 2014). What constitutes our learning ecology has become incredibly difficult to articulate and, with information available at the click of a button, anywhere and everywhere, we are beginning to see our learning frameworks and pedagogies transform into those that boast twenty-first century skills, future-proof learning and technological integration (Seely Brown, 2010, p.12). It seems however, that while there is much literature to support the betterment of teaching and learning in the world of continuous transformation, we often overlook what is perhaps the most important consideration, that is, the question raised by David Perkins in Future Wise: Educating our Children for a Changing World (2014), what is actually worth knowing, learning and understanding for a student of the digital age? Consideration of this question, while incredibly broad in scope, provides an important starting point in our quest as educators to reimagine education in contemporary society. While we can transform the way we teach and reconsider how we learn in the twenty-first century, if we do not stop to determine the relevancy of what is worth learning, we could be missing the point of learning completely. It is this factor that makes Perkins’ discussion in Future Wise: Educating our Children for a Changing World pertinent for all educators of the digital age. This review will provide an overview of the key themes of Perkin’s dialogue around what is worth learning and analyse and compare this discussion to relevant scholarly literature in the field. Limited in that Future Wise: Educating our Children for a Changing World does not answer its overarching question of ‘what is worth learning’, what it does provide is an essential toolkit of ideas for all educators to contemplate as we work to revolutionise perhaps one of the most fundamental yet often marginalised considerations of education in the twenty-first century; is what students are learning in school likely to matter in the lives they are likely to live? Future Wise: Educating our Children for a Changing World is founded in the research and work of David Perkins, Research Professor of Teaching and Learning at the Harvard Graduate School of Education. A founding member of Harvard’s Project Zero, a research and development institute at Harvard, Perkins boasts an extensive body of work focused on teaching and learning over his lifetime, including collaborations with notable contemporaries such as Howard Gardner and Veronica Boix Mansilla. Traditionally, David Perkins adopts a social constructivist epistemology in his work, and this also underpins many of the themes in Future Wise: Educating our Children for a Changing World. Qualitative in nature, the content of Perkins’ book is based around experiential narratives and analysis from his years as a teacher, lecturer and researcher, and compiles a body of ideas and discussion to support well-grounded prior research by Perkins and other experts in the field. While intended to inspire educators to take the first step towards reimaging the curriculum offered in our complex and ever-changing world, the style of this book makes it accessible not only to educators, but also other parties such as parents, students and policy-makers invested in thinking about the currency of what is learnt in schooling systems. As admitted by Perkins in his introduction, the scope of ‘what’s worth learning’ is incredibly broad and almost impossible to answer, thus, instead of attempting to answer the question, Perkins offers what he articulates are better ways of thinking about what’s worth learning for most people in school (2014, p.4). This is one of the strengths of the book, as readers are given the opportunity to embrace and reflect on the wisdom offered through the ‘try this’ activities scattered throughout and the comprehensive ‘reimagining education’ analysis located at the end of each chapter. Through his ‘reimaging education’ sections, Perkins assists learners to keep track of the ideas developed in each chapter as he provides analysis under four main quests: “identifying learning in contrast with not-so-lifeworthy learning”; “choosing what lifeworthy learning to teach from the many possibilities”; “teaching for lifeworthy learning in ways that make the most of it”; and “constructing a lifeworthy curriculum” (2014, p.25). Cleverly, these sections allow the readers to transfer their newfound knowledge into understandings through examination of practical and relevant examples, a concept discussed by Perkins as essential for learning that is future-proof. Debate over what constitutes learning has been historically concerned with how knowledge is constructed and transferred to understandings in the mind of the learner (Dewey, 1910, p.44; Forman & Kuschner, 1977, p.84; von Glaserfeld, 1989, p.128). In Future Wise: Educating our Children for a Changing World, Perkins emphasises the importance of knowledge construction and transference through his assertion that the learning we offer students must not only be ‘lifeworthy’- “likely to matter in the lives learners are likely to live” (2014, p. 8), but also ‘lifeready’ – “ready to pop up on appropriate occasions and help make sense of the world” (2014, p. 24). This assertion echoes the work of academics such as Seely Brown, who suggests that knowledge is made up of a combination of explicit and tactic dimensions which, when applied together, constitute learning (2000, p. 15), and Bruner, who suggests that learning involves interconnection between both explicit and practical knowledge, leading to enculturation (1960, p.14). With this in mind, Perkins raises an issue worthy of consideration for educators when he asserts that the learning that has traditionally occurred in our school systems risks redundancy, as the knowledge students are attaining becomes increasingly irrelevant, and consequently, inapplicable to the lives they are likely to lead in the digital age (2014, p.7). Interestingly this notion furthers the work of early educational theorist John Dewey, who warned that, “only in education, never in the life of farmer, sailor, merchant, physician, or laboratory experimenter, does knowledge mean primarily a store of information aloof from doing” (1916, p.185). Nearly a century later, this notion forms the foundation of Future Wise: Educating our Children for a Changing World, as Perkins acknowledges the growing trend in teachers wanting to push the boundaries of what is taught in their classroom to make learning more relevant to the lives their students are likely to lead (2014, p.2). In response to this Perkins identifies ‘six beyonds’ that he proposes collectively represent the growing concerns among educators when considering how to prepare learners for our contemporary world. 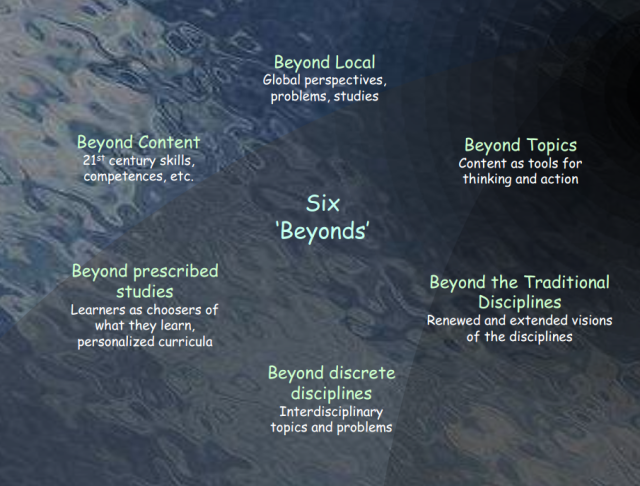 The beyonds cover going beyond: basic skills – twenty-first century skills and dispositions; the traditional disciplines – renewed, hybrid, and less familiar disciplines; discrete disciplines – interdisciplinary topics and problems; regional perspectives – global perspectives, problems, and studies; mastering content – learning to think about the world with the content; and prescribed content – much more choice of what to learn (2014, p.2). It is contemplation and adoption of these beyonds that Perkins alleges will force educators and their systems to revise the knowledge necessary for lifeworthy and lifeready learning and successfully prepare learners for their unknown future (2014, p.8). In the shift from the industrial age, through the knowledge age and into the constantly evolving digital age, the world that students are exposed to has become considerably larger. Where learning has conventionally involved knowledge attainment, Perkins asserts that this no longer aligns with the connected and networked environment of today’s world (2014, p.40). The traditional educational goals of knowledge and content attainment have become ineffective in preparing students for life outside of school as our globalised, networked world has quickly devalued much remembered information (2014, p.43). This has created what Perkins deems the ‘small world paradox’, that is, as our ability to connect and interact with worlds beyond the classroom becomes a norm in learning, our collective worlds become smaller, making the worlds we engage with individually more numerous and complex (2014, p.46). This is reiterated by scholars such as Trilling and Fadel who fear that, “the potential for information overload, distraction, and analysis paralysis when facing demands for attention from too many sources – ranging from well-informed and reliable to woefully uninformed and even deliberately misleading – is high” (2009, p.17). Hence, Perkins’ recommendation that instead of foregrounding specialised disciplinary knowledge, education should value building expert amateurism in its learners, that is, learners who are able to understand and apply basics from individual disciplines across and outwards to other areas (2014, p.38). This is not to diminish the more quantified knowledge needed for further study in specialised areas, however, Perkins suggests that, particularly at a middle school level, “the expertise agenda in basic education skews learning toward advanced technical content not helpful to most learners in the lives they are likely to live” (2014, p.47). Perkins is not lessening the importance of discipline specific knowledge, however in building on the ideas of educational evangelists such as Sir Ken Robinson, he is challenging educators to reevaluate whether this knowledge is relevant to the lives all learners in school are likely to live (Robinson, 2001). Perkins suggests that through ‘smart sampling’ of curriculum we needed to provide learning and knowledge that promotes big questions and big understandings, allowing students to use their expert amateur knowledge to connect with the ever-changing world around them as needed. His following discussion on the relevance of hybrid curriculum, cross topics and analysis of twenty-first century frameworks (or ‘big know-how’), makes Perkins’ book particularly pertinent, as it becomes apparent that focusing on what is worth learning needs to come before faddish innovations in technology, pedagogy and processes of learning (2014, p.220). While providing a toolkit of important considerations for learning in the twenty-first century, refreshingly, Future wise: Educating our Children for a Changing World does not make the assertion that there is one right answer in transforming the education offered to students. Rather, Perkins’ motivations in this book are best articulated through his request that we as educators think about what application the learning in our first twelve years of education has had on our lives today. More often than not, Perkins avows, it was the knowledge and skills we acquired that allowed us to create big understandings across topics and disciplines and provided relevance along the way to greater wisdom in the lives we have and will continue to lead. David Perkins has authored a book grounded in relevant research that collates, analyses and discusses current educational debates about what is worth learning in the digital age, delivering better ways for us to think about how to answer this question. While readers may find Perkins’ content and ideas unsettling, this is what makes his work so efficacious; if we as educators are not thinking about the relevance of content, knowledge and curricula offered in our teaching and learning, we are not providing the best possible learning for our students. Bruner, J. S. (1960). The process of education. Cambridge: Harvard University Press. Costa, A. L., & Kallick, B. (2009). Habits of mind across the curriculum: Practical and creative strategies for teachers. Alexandria, VA: Association for Supervision and Curriculum Development. Crockett, L., Jukes, I., & Churches, A. (2011). Literacy is not enough: 21st century fluencies for the digital age. Thousand Oaks, CA: Corwin. Dewey, J. (1916). Democracy and education: An introduction to the philosophy of education. New York: MacMillan. Forman, G., & Kuschner, D. (1977). The child’s construction of knowledge. Belmont, Calif: Wadworth Co.
Gardner, H. (2006). Five minds for the future. Boston: Harvard Business School Press. Hattie, J., & Yates, G. C. (2014). Visible learning and the science of how we learn. Routledge. Price, D. (2013). OPEN: How we’ll work, live and learn in the future. Crux Publishing Ltd.
Robinson, K. (2011). Out of our minds: Learning to be creative. Oxford: Capstone. Trilling, B. & Fadel, C. (2009). 21st century skills: learning for life in our times. John Wiley & Sons. von Glaserfeld, E. (1989). Cognition, construction of knowledge, and teaching. Synthese, 80 (1), 121-140. doi: 10.1007/BF00869951. “Only in education, never in the life of farmer, sailor, merchant, physician, or laboratory experimenter, does knowledge mean primarily a store of information aloof from doing” – John Dewey (1916, p. 178). We see this more than ever before in the digital age, our students question the worth of what is being taught in our classrooms and its relationship to the lives they are likely to live. Of course, rapid advancements of technology, the emergence of the information society and the reality of information overload are instrumental in providing an even larger gap between traditional schooling and what students will actually need in their world outside of school, as educators struggle to keep up with this ever-changing landscape (Bawden & Robinson, 2012, p.243). But interestingly, we often hear students favour certain subjects such as Physical Education or Home Economics because of their ‘practical’ curriculum, and I’m wondering why this isn’t relevant to all disciplines. David Christian when he writes about ‘big history’ provides an interesting contrast between humans and other primates. Unlike creatures such as chimpanzees, humans are the only beings that aren’t living the same lifestyle they were 100, 000 or even 500 years ago (2004). Christian asserts that this is because of humans’ ability to learn collectively, or pass on relevant life-learning to others. If this is the case in the ‘real-world’, why are we still witnessing educational systems that are preparing students to pass exams, yet unprepared to engage and prepare students for their life after school? Our notions of knowledge and learning are slowly beginning to evolve. As Starkey suggests, the digital age has lead us to gradually change our teaching and learning practices from focussing on knowledge attainment to more skill-based learning that promotes critical thinking, knowledge creation and learning through connections (2011, p 19). While zeroing in on the skills necessary for learning in a constantly changing landscape is a positive step, I’m wondering if we need to go beyond this focus in order to ensure that our students are indulging their curiosity when they ask ‘what’s worth learning’, so that they can feel assured their learning in the classroom today is relevant to the future lives they are likely to live. David Perkins in his book Future Wise: Educating Our Children for a Changing World presents 6 ‘Beyonds’ (below) that allow educators to push the boundaries of what is traditionally taught in school and consider the expanding universe of what’s worth learning. When examining the 6 ‘Beyonds’ we can see that education in the digital age needs to cater for more than the acquisition of skills and technology integration. 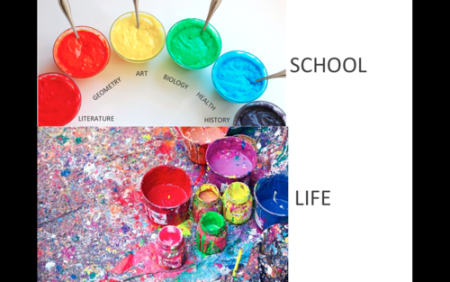 We must consider what constitutes our learning ecology and ‘go beyond’ the world of traditional education to ensure our students are prepared for learning that is ‘lifeworthy’ – “likely to matter in the lives learners are likely to live” (2014, loc 395), and ‘lifeready’ -“ready to pop up on appropriate occasions and help make sense of the world” (2014, loc 694). This learning will only be possible when we consider learning collectives in networked environments, rather than learning in our traditional hierarchal classrooms. This concept of ‘going beyond’ through our knowledge networks is one that I intend to consider further in my quest to determine ‘what’s worth learning‘ in the digital age. Bawden, D., & Robinson, L. (2012). Information society. In Introduction to information science (pp. 231-249). London: Facet. Christian, D. (2004). Maps of time: An introduction to big history. Berkeley: University of California Press. 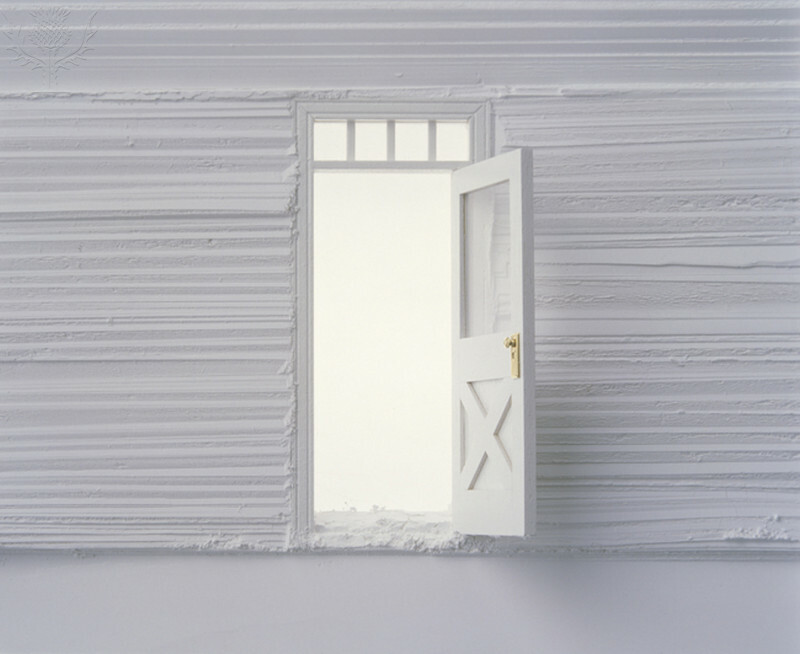 Open white door floating plaster wall, . [Photography]. Retrieved from Encyclopædia Britannica ImageQuest. Starkey, L. (2011). 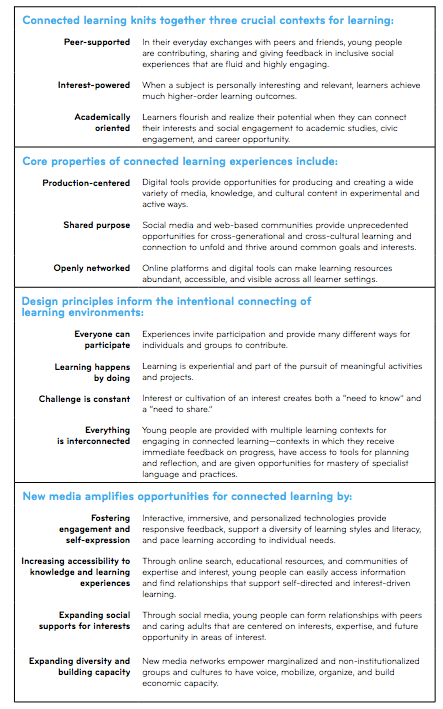 Evaluating learning in the 21st Century: A digital age learning matrix. Technology, Pedagogy And Education, 20(1), 19-39.